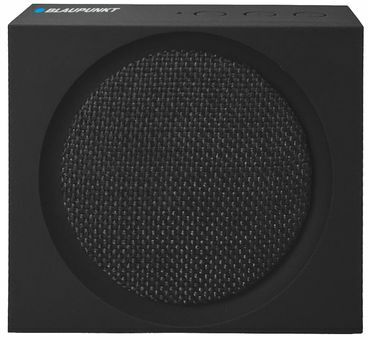 A Bluetooth loudspeaker is an inseparable element in social meetings at home or outdoors. This device will also improve the sound quality of your telephone or tablet. Any sportsperson, beachgoer, party goer or student will certainly appreciate the clean sound flowing from this small-sized loudspeaker. The BT03BK is a high-quality device which allows you to enjoy your favourite music wherever you are. The Bluetooth function lets you play selected music from such devices as a tablet, a smartphone or a laptop, and the mp3 player with a micro SD card (up to 32GB) slot allows you to listen to your favourite songs saved in your own music library. The FM tuner will satisfy the needs of those who prefer to spend time listening to their favourite radio station. The built-in battery, charged via a micro USB port, ensures very-long operation time on battery power (7 hours). The device housing is made of a material which is pleasant to the touch, and the speaker cover is finished with a fabric material which makes for a very-attractive appearance.